Add wings and cover over night in refrigerator. In medium sauce pan sauté shallots until clear. Add apricot syrup, brown sugar, lemon juice, soy sauce and spices. Bring to a boil stirring constantly. The glaze will thicken as it cooks. When glaze thickens, set aside. Take wings out of marinade and grill, when wings are just about done start basting on the glaze. Cook wings on med heat 15-20 minutes. When they are done take the remaining apricot halves and brown them on the grill and baste remaining glaze on them. 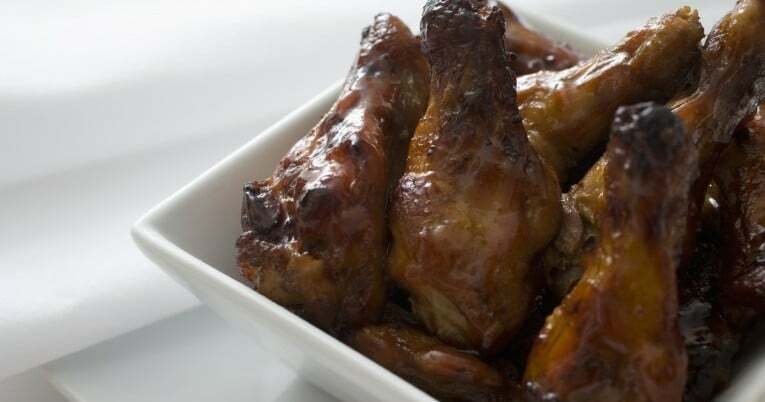 The wings can be cooked 3 ways: Grilled, Baked or Deep Fried. When deep-fried, the glaze can be used as a dipping sauce.